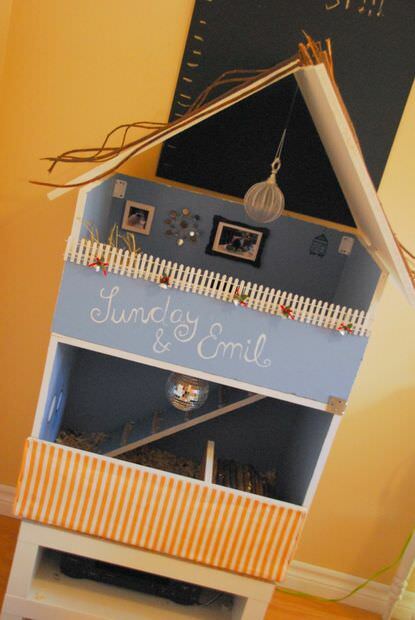 If you have a guinea pig you understandably want them to live in splendor. If you can’t find one for sale that meets your needs, it’s actually not that hard to build your own. 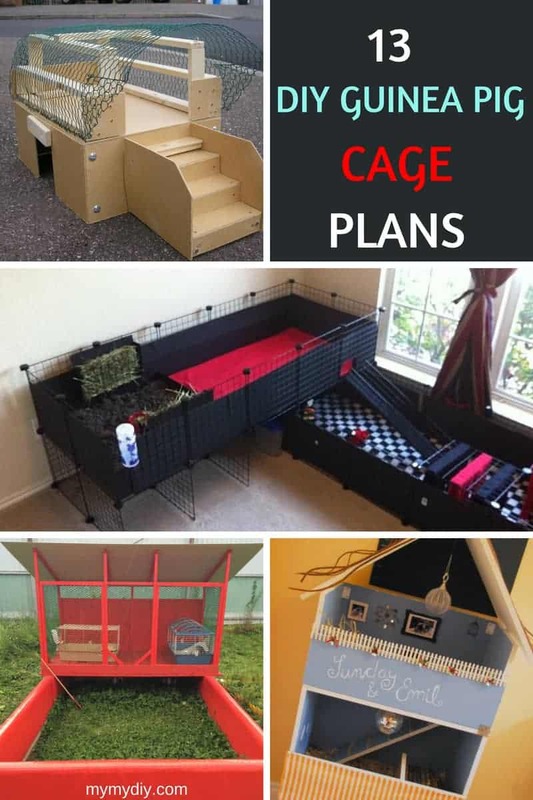 We’ve assembled an eclectic list of DIY cage plans. Some designs include a massive, L-shaped two-story design (#13); an outdoor structure (#12) and even a fun dollhouse blueprint (#7). 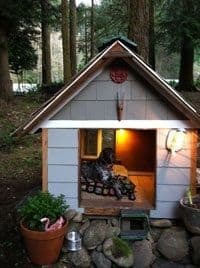 If you have any old furniture sitting around, try making this one of a kind house for your furry friends. 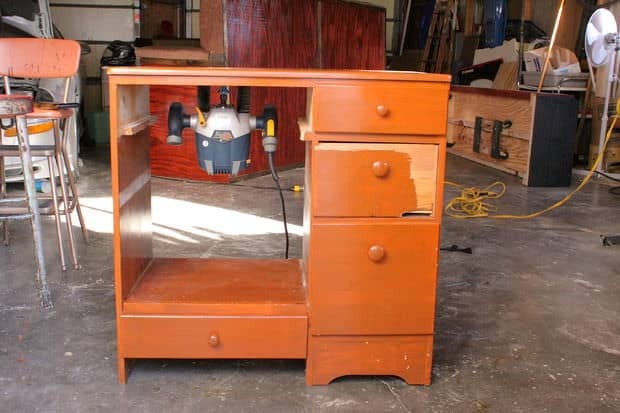 This builder found theirs on the street, as a neighbor was throwing the chest away. Just pick a chest relative to the size your cage is going to be. You’ll need some hinges, drain pipes, wires, a drill, wire cutters, and more, but this project is well worth the effort. 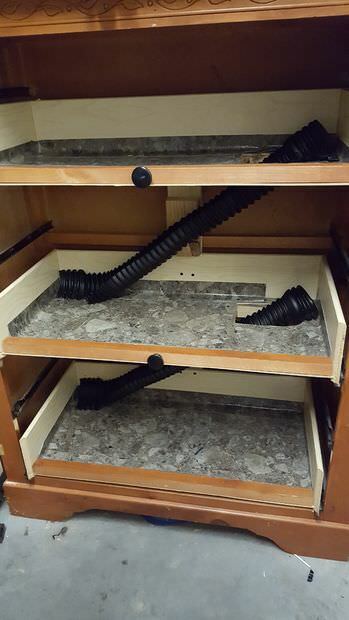 You can cover each shelf/level with carpet, foam, tiles, or keep the wood. Don’t forget to include a way to lock the doors — you don’t want your guinea pig getting out. A dog leash clip actually works well for this. Although time-consuming, this DIY is fun, creative, and resourceful. This project is simple, can be done with your children, and only requires three supplies. The shape of the structure is completely customizable — you can make a dome, pyramid, rectangular house, etc. 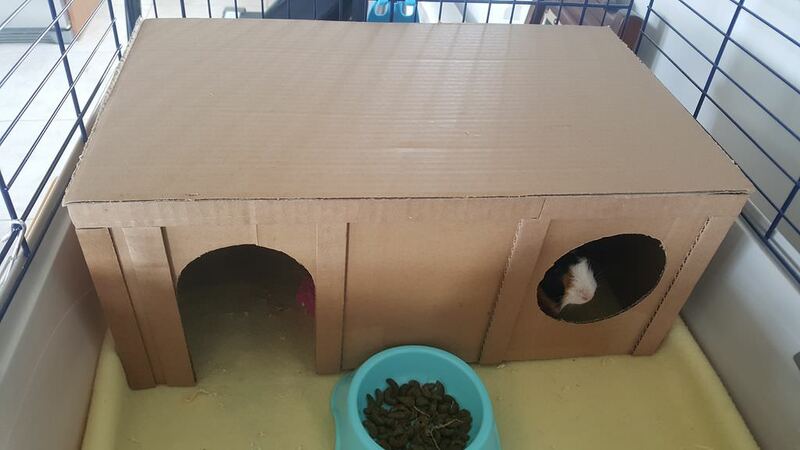 Just make sure to measure your guinea pig’s cage and cut the walls out so everything will fit. Use a strong but non-toxic glue to adhere the walls and roof together. This is probably unnecessary and completely superfluous, but you can paint and decorate the outside and inside of the house. Consider making a brick design, adding a “Home Sweet Home” sign by the front entrance, or painting a fake garden on the perimeter. This is another creative idea for making a cage with some personality. You might even have some of the supplies already, like paint, magnets, pieces of fabric, and knick-knacks. Cut and paint your wood (using a bright color really brightens up the space and your home), stick it together, and you’re basically done. The designer made a staircase to the upper level by incrementally gluing round sticks on a slanted piece of wood. He also replicated his family’s own living room in the design. You can put up tiny little photographs and frame them, make couches out of foam or plastic, use parts from dollhouses, etc. 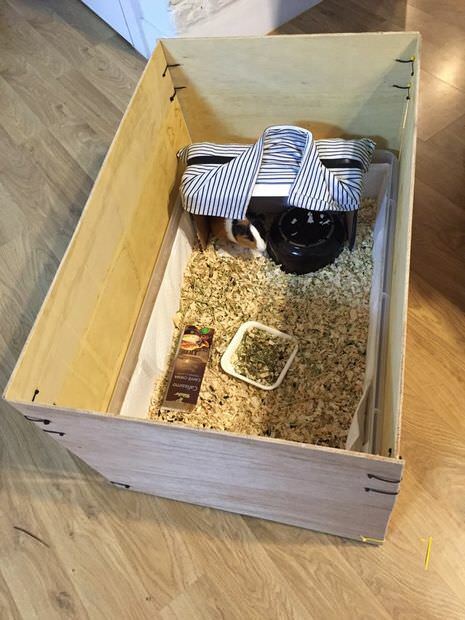 If your guinea pig is a troublemaker and often finds ways to sneak out, try making this. The builder says it only took an hour to make and wasn’t expensive. The materials needed are wood panels, zip ties, pliers, a drill, copper wire, and a hacksaw. The wood needs to be very tall to prevent any possibility of escape. Interestingly, the whole structure is held together by wire and zip ties — no glue is required at all. Your kids might enjoy helping you put the walls together. When you do want your friend to come out and play, the walls can be expanded and stretched out to create a bigger area. This is definitely an ambitious project for those who really love their pets. The builder claims this took about five days to complete with his family and cost $70. Setting this up in your backyard or patio is a great way for your furry friend to get some fresh air and stay safe. Supplies needed include timber/wood, paint, a saw, screws, and power drill. This enclosure will give your pets tons of space to run around and graze — just make sure to secure the walls and mesh well to ensure they can’t escape. The builder also made a roof using PVC panels larger than the base. This way, the inside of the house won’t get wet if it rains. This is the perfect DIY for someone familiar with woodworking or interested in learning. 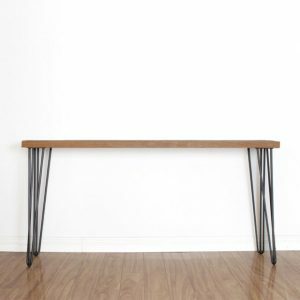 Relatively simple, all you need is wood, glue, plexiglass, screws, and a saw or cutting tool. Make sure your measurements are correct before cutting! This cage also features a floor that slides out. Place a garbage pin underneath this, slide the tray out, and all the old bedding and waste will fall right in. This open concept also makes playing with your pets a lot easier — the sides and back of the structure have mesh walls, though the front simply has a short bar of plexiglass. 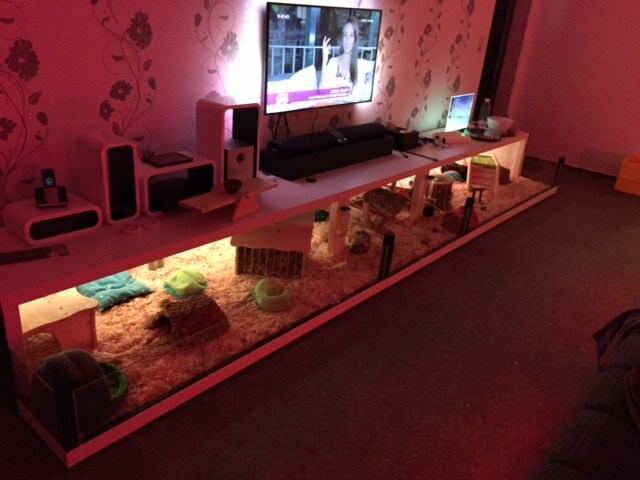 This allows the guinea pigs to get fresh air and for you to easily interact with them. 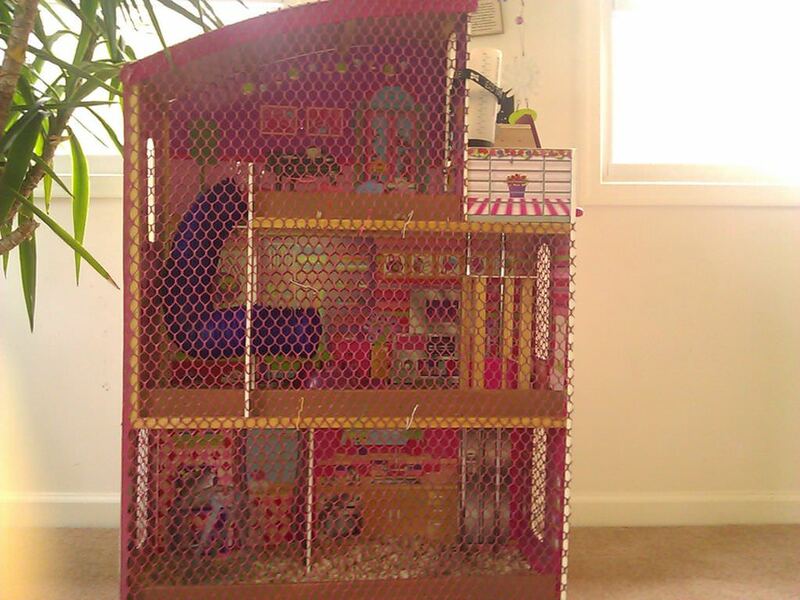 If your children have outgrown their dollhouses and toys, try converting it into a new home for their pets! You’ll need a few simple supplies like a hot glue gun, wood, paper clips, mesh netting, and a staple gun. Just make sure to secure any openings in the playhouse so your furry friends won’t escape. You’ll need a point of access to change the bedding and water, but you can actually use paper clips as a lock on the door. Your kids can help craft this project and the mesh can be painted any color of your choice. 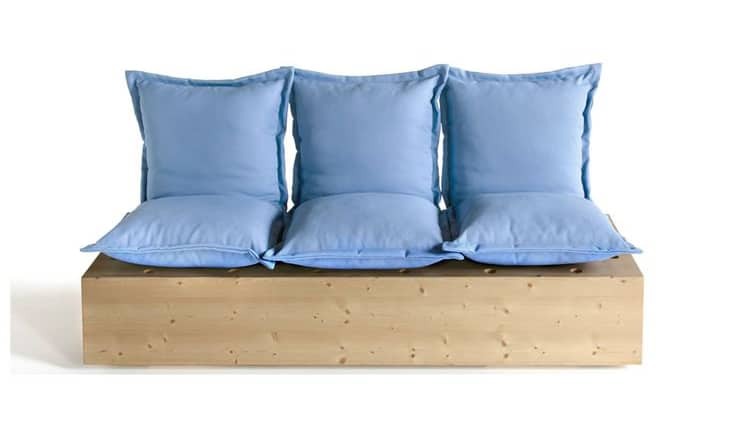 This provides a large amount of space without taking up tons of room in your home. Most people have a storage space in their backyard that is just filled with junk and not often used. Turn this into a new home for your pets! This is perfect for rabbits, hamsters, guinea pigs, or mice. You’ll need to take out a wall and replace it with mesh to improve airflow, but not much else needs to be done. Since this is outside, it is very important to have a balance between fresh air and climate control. Don’t forget to put some lights in the enclosure if you don’t have any already. 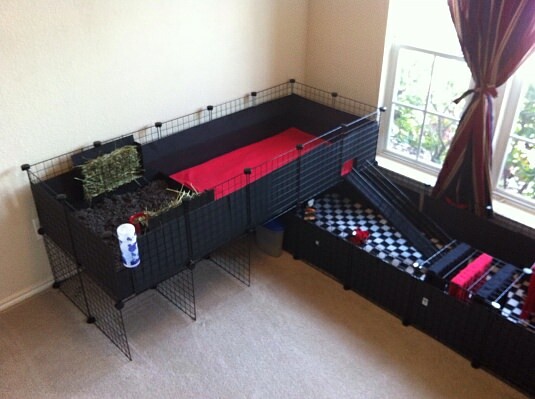 This is a great way to repurpose space you already have and give your pets more room to run around and play in. If you’re looking for a basic project to do with your children, try making this simple house. The designer only paid $20 for supplies and spent two hours crafting. You need wood, wire netting, screws, a drill, and your imagination. This will be placed inside your guinea pig’s cage, so take measurements and build the house accordingly to make sure it will fit inside. Think about what your pet likes to do — sleep, climb, run on a wheel, go up stairs, etc. You can include all of these things, as well as decorations. If you have time, paint the wood a different color or pick a theme to design off of. 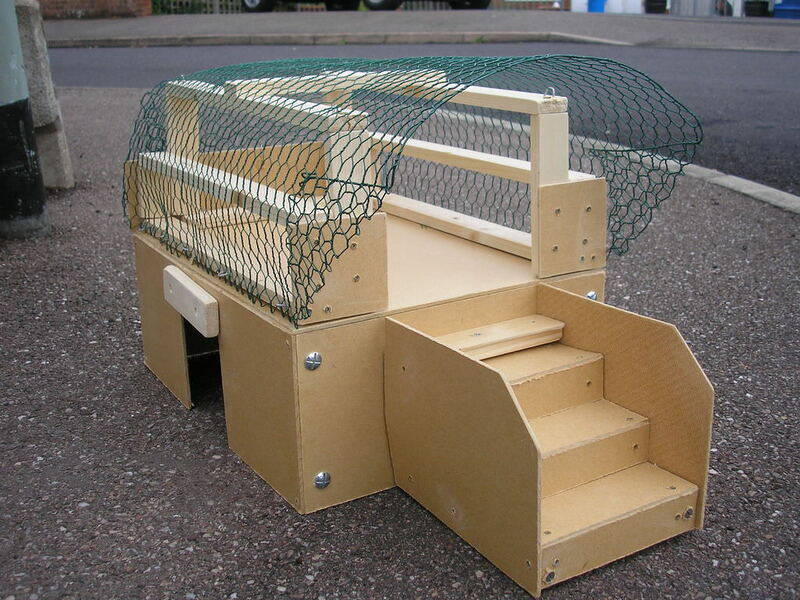 If you have an existing enclosure but find that your animals need additional space, trying making this to add a new room. Like most of these DIYs, you will need wood, a drill, screws, chicken wire, a hammer, and more. Sketch out and cut your wood panels, following the existing structure that you have. The builder suggests looking online for inspiration on what type of building and look you want to go for. To connect the two, simply drill through the new walls into the old cage. This is a great solution for more space that doesn’t mean throwing away the enclosure that you already have. Since this is a separate room, you can design it as such. If your living room is spacious enough, consider turning your coffee table into a home for your pets. This builder combined five inexpensive tables to make this huge enclosure. They also added string lights around the corner to give off colorful lights during the night. This piece is functional, looks very cool, and gives your animals tons of room to roam while being close to you. If you have other pets, like dogs or cats, you will probably need to add mesh fencing or wood panels to prevent any problems between the two. 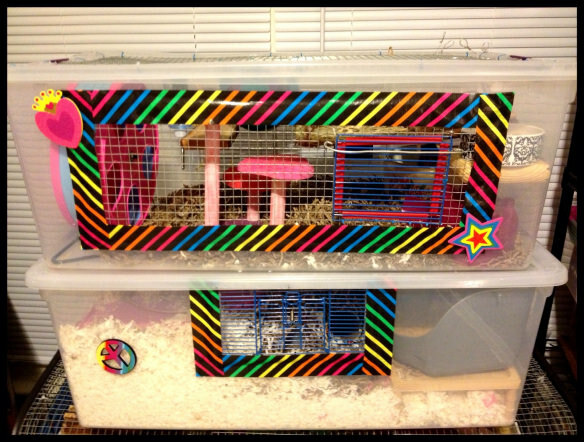 Since the space is so large, you can add multiple hamster wheels, decorations, “furniture”, tunnels, and more. Chances are you have a few plastic containers somewhere in your home. Believe it or not, you can use those to make a new cage for your guinea pigs. This builder stacked two on top of one another an connected them with a plastic tunnel. 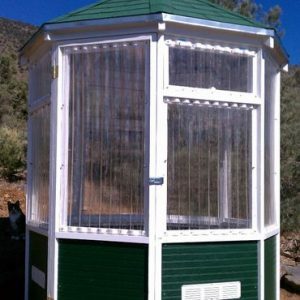 Of course, you’ll need to cut out one or two sides of the container and replace them with mesh netting for ventilation. To do this, you’ll need a soldering iron, knife, tape, and glue. This DIY is perfect for kids, as they can help decorate. The fact that these are bins also allow easy clean up. For example, to change the bedding, just open the lid and dump it out. 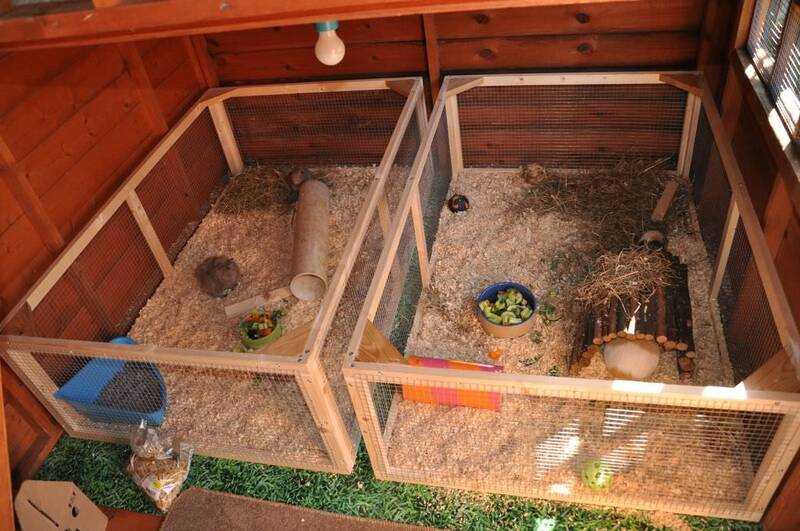 Guinea pigs actually need more space than you think. Depending on the size of your home, try this DIY using grids. You’ll have to make blueprints and design this well before you start building. Do you want an L shape? Or maybe a big rectangle? Either way, you’ll also need poster board, a drill, screws, and some type of flooring, such as a mattress liner. Keep your pets in mind as you design this and fill it with their favorite things. The builders on this forum used real and fake grass, stairs, hamster balls, and other play equipment you buy online or at local pet stores. This is a kid-friendly project that will help your animals live healthier and happier lives. For fans and “slaves” of guinea pigs (aka, “Cavies”) encouraging the proper techniques in raising and caring for guinea pigs. 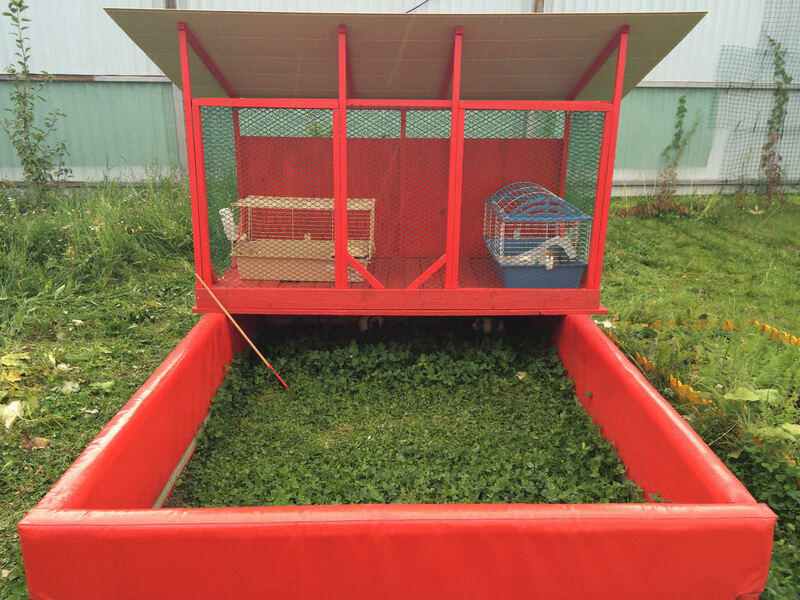 One user posted searching for support- he was looking to find a spacious cage because the one he has currently isn’t big enough and he feels somewhat guilty sticking his pets in there. One person said that it would make sense to build your own- possibly employing long wire closet shelving as a potential lid. This could actually be sturdier then some of the canvas options that are also on the market. You can zip tie caging together to keep it sturdy and protect your pets from cat attacks if you also have felines in the house. 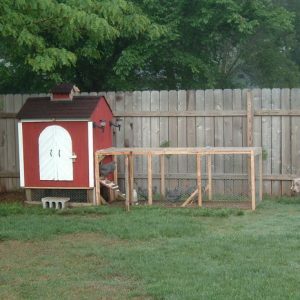 Deeper in the thread another user submitted a page that directed to the Metropolitan Guinea Pig Rescue website- they list out cage size standards by the number of pigs inside. 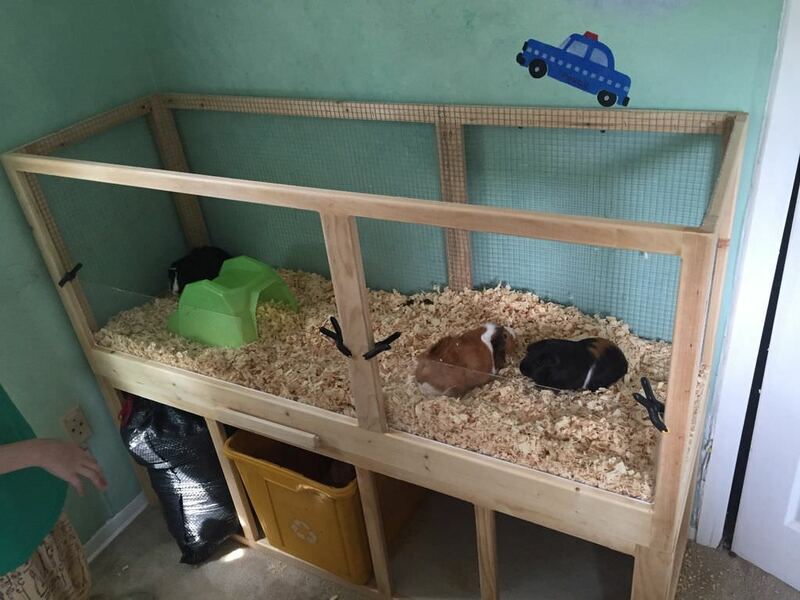 The website makes the point that a lot of the store-bought solutions aren’t actually suitable for these pets because they are too small and often feature wire grid flooring which isn’t ideal for the pigs. If you’re interested in purchasing, rather than making, you can check out their site to see some of the ready-made cage options they recommend. Some include the Midwest Habitat and the Tubbies Cage. In another area of Reddit, a poster wondered what would be the best option if you don’t have a lot of space. In this user’s case, he’s heading off to college and wants to take his two pets with them to an apartment. 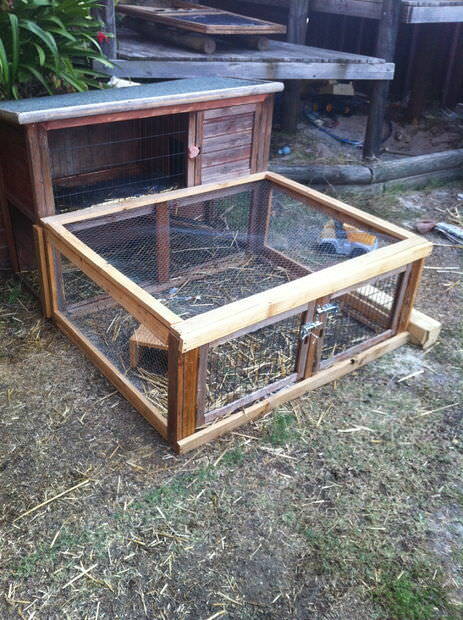 He was using, at the time, a rabbit cage- he said it was particularly spacious but wasn’t exactly loved by his pets either. One user said that it’s advisable to make a cube a coroplast, two-level cage. One of the benefits of a DIY option, in this case, is that you can customize the size to your special needs. Another user submitted an image of a particularly spacious build that utilizes grids, shavings and a bunch of fun accessories like tunnels and pigloos. For the shavings, this user recommended using paper-based care fresh bedding or aspen shavings- both of these can be found at local area pet stores, though he says other people sometimes employ fleece bedding that contains an absorbent layer. Another user wondered how to best create and secure a top lid to prevent escape. A user replied that you can purchase a full flip over as a covering. Another user linked to PetFinder.com- it provides a lot of care tips if you are a new owner. One of the biggest issues they observe is that parents mistakenly believe that these pigs are low demand options for children. Lyn Zantow Domesticated more than 500 years ago in South America, guinea pigs were first brought to Europe in the 1500s by the Spanish and later the Dutch, making their way into the homes of the wealthy as novelty pets. However, these companion animals do require a fair amount of upkeep. One of the issues they point out is that they are so fond of chewing on things because it helps to file down their teeth which apparently constantly grow. This means that everything inside of their domicile needs to be non-toxic. Another issue when dealing with these rodents is that they are very sensitive to stress so must be handled gently. Because they are herbivores, and also need a lot of vitamin C, it’s best to purchase a commercial guinea pig food formulation that is also supplemented with vegetables like cabbage and kale. Also, you have to brush and comb them to keep them tangle free. They are pretty fastidious creatures in and of themselves, constantly grooming, but they will need some help. That also means you’ll need to clean out the cage lining routinely- disinfecting and scrubbing it. One of the final tips they offered was to keep two of them together- they are much happier when they have a companion. It’s important to research ahead of time- some combinations aren’t compatible. For instance, two male species will actually combat each other. Overall, it’s best to do a lot of research ahead of time- you can’t assume that these are ideal pets for your kids because they do require a fair amount of maintenance to keep them healthy and happy. This includes specialized dietary plans, a robust cleaning schedule, knowledge about how to handle them-all this means is that an adult should be the primary caretaker rather than a child who is not mature enough to be the sole caretaker.